One of the things I love most about travel and exploring the world is the opportunity to photograph and capture everything in my path. My photography has been a journey that has paralleled my life's path. When I saw the opportunity to showcase it a bit for Thomas Cook in a photography contest I jumped at the opportunity. Here are my submissions for the contest where I show you how I have explored the elements along my travels! Be sure to click on each image for full effect. I chose this photo because I couldn't think of a better way to portray Earth than a photo of Earth actually being made. This old lava flow took out even the most stubborn of buildings and roads on it's gravitational journey to the ocean. Quite the impressive thing to see the inflation of the lava as it cools and creates land. I choose this water pic from a road trip years ago that took us in to Yellowstone National Park. 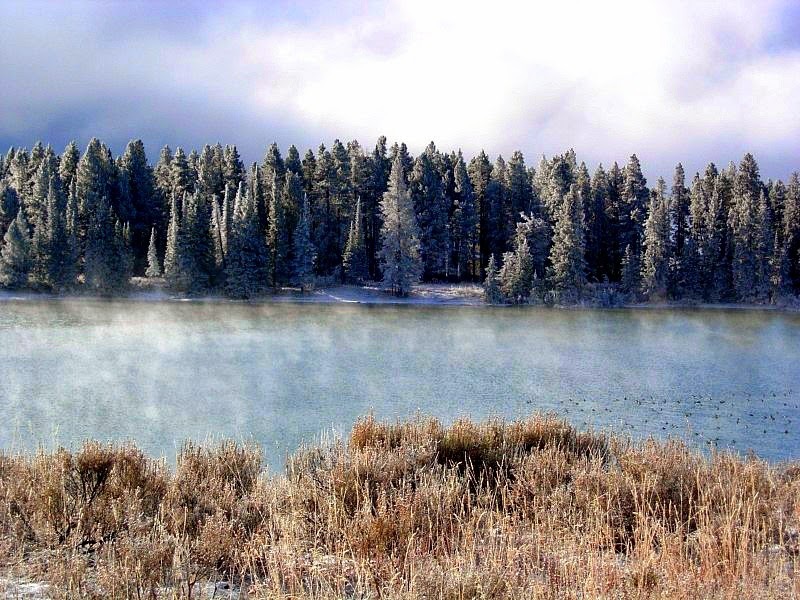 I picked this photo because it shows all the forms that water takes in just 1 pic, steam rising off the lake, frost covering the grass and trees beyond, and the lake itself still liquid but just barely. It demonstrates the adaptability and flexibility of this element perfectly. A few months ago the kids and I were given the chance of a lifetime, viewing the June 27th lava flow on the Big Island of Hawaii! 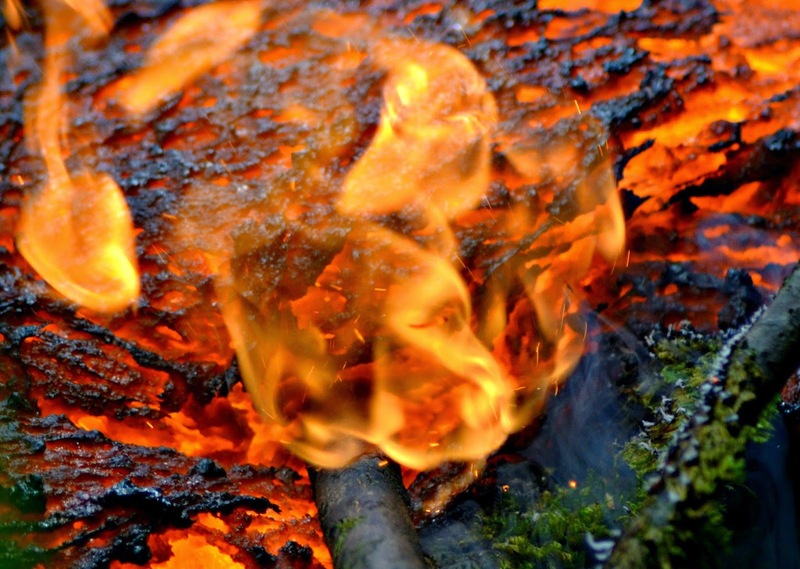 We were able to get up close and personal with fire in the most forceful, spiritual, and moving sense. Locals believe that Pele, the goddess, is alive and well in the lava and dictates where and when it will flow. Here you see a glimpse of the spirit of Pele herself in the flames accompanying the lava. Most people would never guess this was taken in Hawaii on top of the tallest mountain in the world (measured from it's base deep in the Pacific Ocean). This is Mauna Kea in winter, after a huge snowstorm where we were met with such an expanse of sky that it left us awe struck. There is a freedom that is palpable as you climb through and above the clouds. The sense of good will and cooperation in such a unique environment was thrilling. There you have it! What do you think of the photos I chose? I had NO idea that it snowed in Hawaii on the mountain tops! Learned something new today. M fave shot is the lava deal. Stubborn roads and buildings indeed. What we create can be wiped out with minimal or pretty much zero effort by Nature. Tsunamis, volcanic flows, tornadoes and hurricanes are tragic to us but a natural purging or clearing mechanism by Mother Nature. She plays no favorites either; just progresses, and grows, and that's pretty much that. Oh these are AMAZING photos Mary!!!!!! Thanks so much! Really wanting to win at least 1 category but only time will tell. Crazy right?! I didn;t know until a few years ag and then it was just last year that I learned Mauna Kea is WAY bigger than Everest. How were we not taught these things in school? Mind blowing, lol. Thanks for the compliment, means a lot! The day we went out to the flow for that shot was just so incredible. Aside frm having my kids it was probably the best experience I have had! A dream of mine since I was little! Nicely done! Beautiful photos and you really captured the elements perfectly. Good luck! Well done, your photos capture the categories really well. Great photos! Love the shot for water - Yellowstone has some amazing opportunity! Great concept for the photos! I think my fave is the water one. Great photos. Everyone seems to be doing this contest, I can't wait to see who the winners are. GOOD LUCK! Nice elements photos, the fire one is my favorite by far!!! Great photos! I really love the earth photo--it's so crazy to see lava flow like that! Thanks so much! I have my fingers crossed. Thanks, I love that one too. It was such a great moment, early morning in October. The water one seems to be pretty popular. Maybe that will be a winner! Thank's for sharing such great photos and good luck with the contest! Thank you. I am most hopeful for that one. It was one of the most amazing days of my life. I hadn't thought of it as a lion, but I guess I can see that too. Pele is the goddess that controls the lava here in Hawaii so I immediately saw her. Thanks, it really is crazy. I feel so grateful to have been here during this time. Really amazing photographs! I love your choice for the Earth category especially :) Good luck! Thanks so much. I can't wait to see the winner pics! You probably weren't taught that in school as it's completely incorrect. Everest is over 29,000 feet high, it's the highest mountain peak on the face of the Earth. 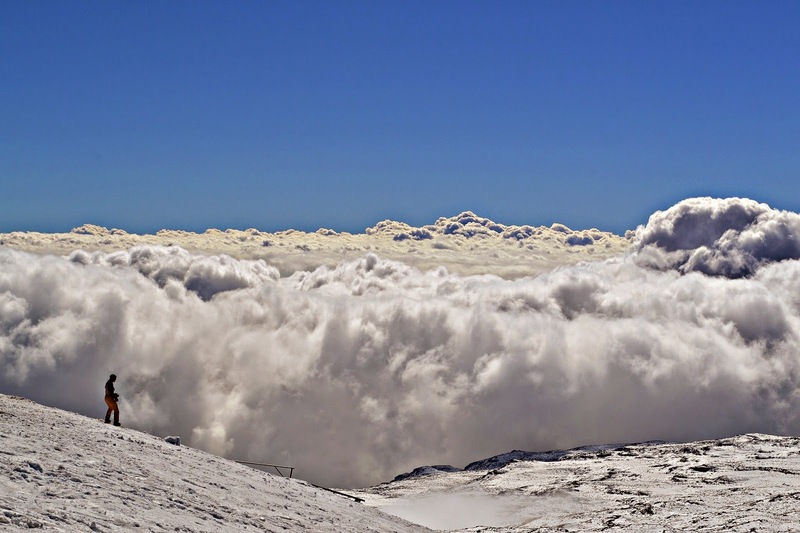 Mauna Kea is under 14,000 feet, so less than 1/2 the height of Everest. Always interesting when the snark comes from an anonymous poster:) There are many ways to measure a mountain and Mauna Kea as measured from its base deep in the ocean brings it to 56,447 ft, well taller than Everest. Even using a conservative model it is 33,000 feet still larger than Everest. (Notice I had said bigger, not that it was the tallest mountain peak:) Also interesting to note that Mauna Kea and its sister volcano/mountain Mauna Loa are so massive that they depress the ocean floor by 4 miles! !